The Epiphany Club – What Was That All About Then? After years of hard work, distractions, and delays (some self-inflicted), I’ve finally got my Epiphany Club series out in print. So it’s time to talk a bit about this book – what it is, why I wrote it, and what it means to me. 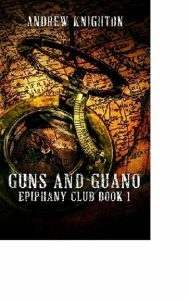 The Epiphany Club started out as a throw-away line in a short story. I was writing about Victorian adventurers heading into the sewers beneath Venice to face the mechanised head of Leonardo da Vinci. To flesh out their background, I made them part of a scholarly club with a history of such escapades. That story became “The Secret in the Sewers”, published in issue four of a magazine called Fiction, and later republished in my collection Riding the Mainspring. And out of that story, Dirk Dynamo and Sir Timothy Blaze-Simms were born. 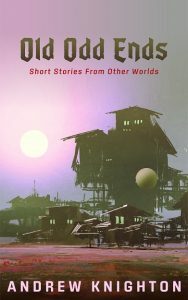 I liked Dirk and Tim, so I ended up writing more short stories about them, some of which saw publication. In fact, I liked them so much that, when I wanted to write something longer, I decided to make it about them. This was a decade ago, a time when I knew much less about writing, but when I went at everything with gusto. 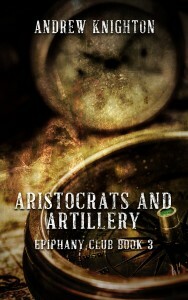 Any fragment of steampunk or Victoriana I came up with was shoved into my Epiphany Club planning. From Parisian sewer maintenance to the aftermath of slavery, in it all went, with little thought to theme, audience, or consistency. By the time I got onto part two of however many, it was a bit of a mess. But it was a mess that I loved and one that could be broken up into novella-sized chunks. So when I decided to try self-publishing, and that the best way to do that was a novella series, it was a perfect fit. In the meantime, I’d learnt more about writing and representation. This led to some big changes in the book, particularly around character arcs and the roles of men and women. The results are something far better and far more coherent than my original vision. It’s far from perfect, as is everything in this world. But for my first serious attempt at putting something this substantial out, I’m still pleased with it, and more fond of my characters than ever before. The me who started this project so messily, creating much more work down the line? Him I’m not so fond of, but it’s a little late for recrimination. Despite the eclectic nature of its birth, there is a coherence to The Epiphany Club. It’s a story that tries to mix pulp adventure with the things we often ignore in steampunk and Victorian adventure stories. Gender inequality, colonialism, and the toxic effects of nationalistic politics are all there. But to stop that dragging it down, there are also strange machines, hideous monsters, and action galore. It’s the sort of adventure story I’d like to read, and so I’m proud I’ve written it. 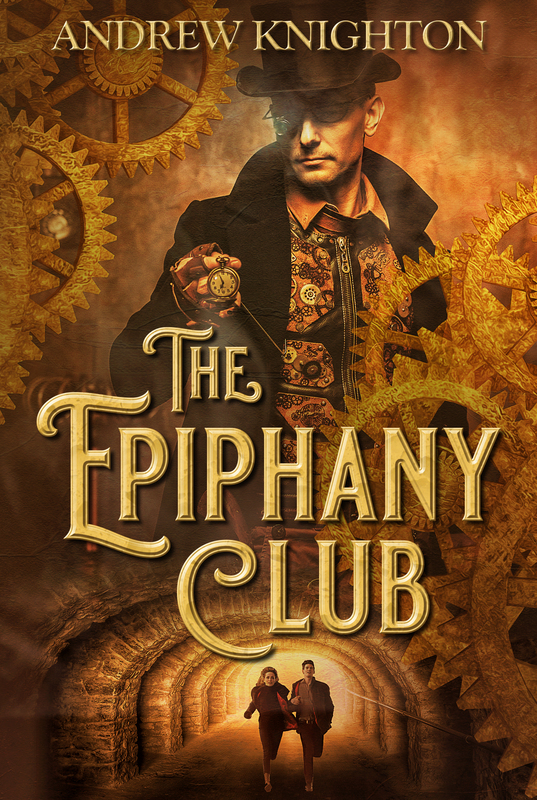 If that sounds like something you’d enjoy, then you can get The Epiphany Club now. And if you enjoy it, please let me know. It’s always good to hear when your story works. This book contains all five novellas in the Epiphany Club series. Available in all good e-book stores and in print via Amazon. This Friday sees the release of the fifth and final instalment in my Epiphany Club series of novellas (you can pre-order it here). These were the first piece of original work I started self-published some years ago. There have been delays along the way, but I’m finally getting to the end of something that’s important to me. I’ve learned a lot from this experience, so I thought I’d share some of it. First up, I learned that I’m not as good as I’d like to be at tackling gender issues. I set out to tackle gender inequality, to present female characters who defy the stereotypes of their time. But along the way, I ended up slipping into modern tropes and stereotypes, like the idea of a woman’s strengths lying purely in her social skills. And because the undermining of stereotypes happens more in the later books, the first one looks like it’s playing even more into the stereotypes. I remedied some of this through the advice of beta readers. I’m also planning on revising the first book quite heavily and re-releasing it, to make things better. I learned that novellas are harder to market than novels. A lot of marketing avenues aren’t open to them, even within the relatively flexible field of self-publishing. I’m going to get around this by creating a collected edition of this series, but it’s made me re-think what I’ll write in future. I’ve got a lot better at planning and at persevering with projects. That’s how I got to the end of this one, despite numerous delays. Just through this much practice, my writing skills have grown stronger. One more reason to revise that first book! Don’t get me wrong, I’m proud of what I’ve achieved. But it’s important to combine that pride with spotting the flaws in my work and the ways I can improve. After all, that’s the only way I’ll get better as a writer. And if I’ve learned one thing from this experience, it’s that I am getting better. Adventurer Dirk Dynamo finally has all the clues he needs and is heading into Egypt to find the lost Great Library of Alexandria. But as he sets out on the final leg of his trail, others are there ahead of him, people who would use the knowledge of the Great Library to nefarious ends. As he races spies and criminals through the land of the Pharaohs, Dirk must decide how far he will go for knowledge, and what he really values most in the world – life, love or learning. 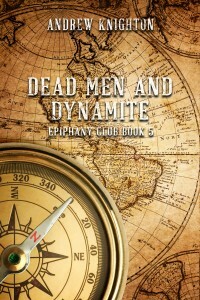 Find out the final fate of Dirk Dynamo and the Great Library in Dead Men and Dynamite, the fifth and final book in the Epiphany Club series, published in February 2017 and available to pre-order now. The quaking of the ground shook Dirk’s whole body. His stomach lurched and his legs trembled as he fought to stay upright. Chunks of rock tumbled from the ceiling of the cave, battering at his head and shoulders. “We’ve got to smash those machines,” he said. He snatched up an axe handle from beside one of the fanatics he had knocked out and hefted the length of wood, testing its weight and balance. Then, with wobbling steps, he approached the nearest of the two medieval machines that were shaking the cave. Its hammers and levers jerked back and forth with frantic energy, driven by an enormous paddle wheel of ancient wood. “They’re gonna shake the whole city down,” Dirk bellowed above the clatter of machinery and falling rocks. Dirk knew that more lives than theirs were at stake. But he’d never have gotten into events like this if he wasn’t fascinated by the wonders of the world. It would be amazing to show people these devices, hidden for centuries beneath the streets of York. Instead of striking one of the paddle wheels, he strode out into the stream, icy water soaking him to the waist, and thrust the axe handle through the sturdy oak spokes. Bracing himself, he tried to hold the wheel back, to stop the machine while Blaze-Simms found a way to turn it off. The machine barely registered his presence. The wheel kept turning, swinging the axe handle around. It smashed into his face. Pain lanced through his jaw as was thrown from his feet. Dirk fell back into the icy water. Currents churned around him. The paddle wheel caught his leg and dragged him deeper, grinding him against the floor. He was caught between the machine and solid rock, paddles battering his back, breath squeezed from his body. He flailed around, desperately trying to pull himself clear, but the currents dragged him back down. He could feel his mind fading as the oxygen ran out. In desperation, he grabbed hold of one of the moving paddles. Clinging on with all his might, he let it drag him around, scraping him against the rock and then the rest of the machine, until at last he emerged, gasping and bleeding, into the air. Flinging himself to one side, he landed heavily on dry ground. He picked up a rock and charged at the machine, letting out all his pain and frustration in a mighty roar. He smashed at the controls with the rock. Smashed at the gears. Smashed at the axle, the paddles, the spokes. When a solid length of wood broke free, two long iron nails protruding from his end, he seized hold of that and used it to keep on smashing. At last, the paddle wheel was reduced to a broken wreck, the gears scattered across the ground. The machine stopped turning. Up the cave, the other device was still going, still shaking the floor and walls. Dirk raised his improvised club and charged straight at it, like he was back on the battlefields of the Civil War and it was the Confederate lines. He wasn’t just fighting for him, he was fighting for all the other people this thing threatened. For Blaze-Simms. For the inhabitants of the city above their heads. For the poor, deluded fanatics who had set this machine in motion and were now about to be crushed by its work. He stumbled on the shaking ground and almost lost his footing on a loose rock. But he kept going, charging straight at the heart of the machine, and slammed into the housing of the paddle wheel. Ancient wood, made brittle by time and fragile by woodworm, exploded into flying splinters. The paddle wheel rolled free, landed with a thud on the stream bed, then began to fall. A sound like screaming filled the cavern as the tortured mass of machinery toppled toward Dirk. With the last of his energy, he dived away. His bruised shoulder hit the ground and he rolled clear just as the machine crashed down. At last, the ground stopped shaking and the cave fell still. Dirk sat enjoying a hearty breakfast of tea and kedgeree. It wasn’t what he usually looked for in a meal, but this was the last day of his holiday and he was feeling adventurous. A piece of loose plaster fell from the ceiling, landing atop his pile of curried rice and fish. So ends another adventure for the Epiphany Club. If you enjoyed this, you can find more stories featuring Dirk and Blaze-Simms on my steampunk page, including links to buy e-books, which will help to fund my writing and keep these stories coming. 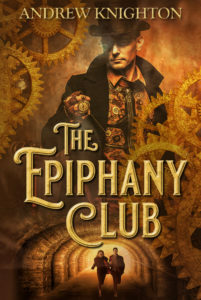 And if you’d like a free steampunk e-book, along with short stories straight to your inbox every Friday, then why not sign up for my mailing list. Next week, something else entirely.